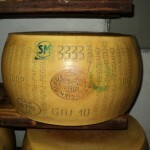 Parmigiano-Reggiano is a cheese that ages for a long time and dates back to the Middle Ages. It was invented by the benedectine monks during the XII century between Parma and Reggio Emilia, from which derives its name. At the end of the tour, there will be a tasting.